Golden Apples: One, Two, Buckle My Shoe..
81- 82, 83- 84, 85- 86—Done, done and done! The good news about this shawl, is the pattern is very regular—it has mirror symmetry, and each repeat is pretty easy to learn. Some times, I don't even have to check the chart for the next row. This is especially true now, in the shaping of the tips of the feather “eyes” . At this point, the pattern is 3 columns of eyelets (that start at stitch 1, and move inward every pattern row) and center decreases on the feather, above the eye.the second half, (after the center decrease) is the mirror image of the first half. Repeat again and K1, becomes K2, and again the “knit some” is minus 2. The Ktog's all line up too, making strong left or right leaning lines. These are strong visual clues that are easy to read—and make it easy to check the pattern every round—and to learn it (and know what is coming on the next round. I try (but sometimes get distracted, and don't) to count the stitches in each motif as I work the plain row—if not a proper count, at least, I count out the pattern-- K x, Yo, knit 1 (a decrease on previous round) YO, knit 1, YO, and to compare the number of knits in the knit “some” section... So 99% of the errors are caught before they have a chance to mess the pattern up too much. It's very easy to pick up an extra forgotten YO, or to double up on stitches that should have been (but weren't) knit together, on the very next row. It's much harder to correct mistakes a few rounds back. But I also realize, this is daytime, early evening knitting—and as it gets later, I need to put it down. I sometimes don't see mistakes when I am tired! Its really just a small part of the shawl--rounds are still relatively short, and only an ounce of yarn has been used so far--(likely I will need over 6 oz. before I am done) But its an accomplishment. So late last night (late=after 9 pm!) it was time to go back to the socks. 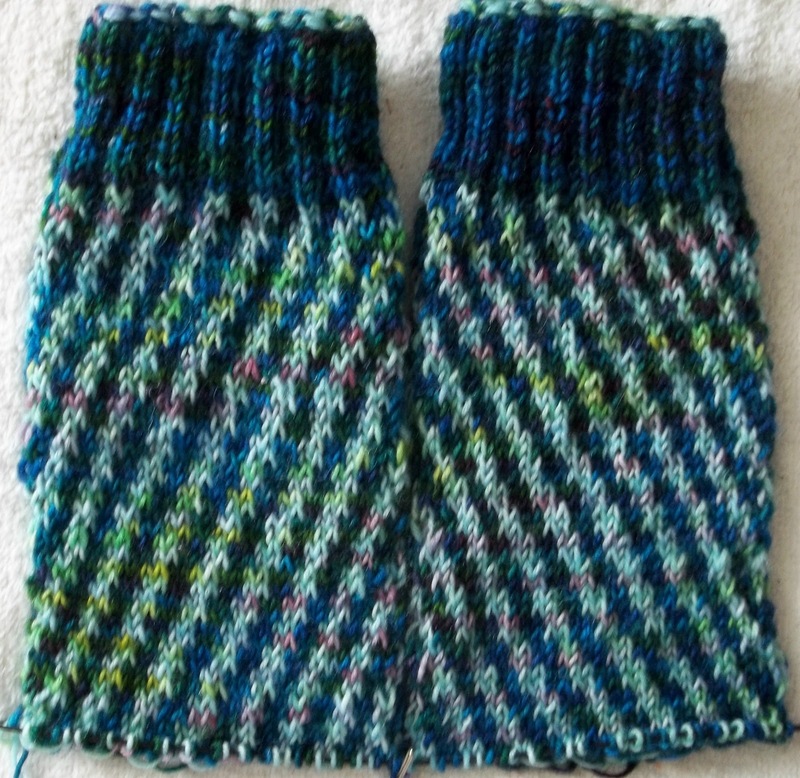 And here they are-- ready for a heel flap. Then, well everyone knows, once the heel is done, there hardly anything left to knit on a sock. 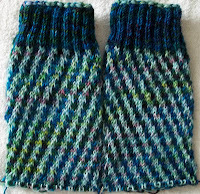 That will be slightly less true for these socks, since the stranded work will continue in the foot, but they are so much fun to knit--it's still half true! I hope to get another 4 rounds of the shawl done today--and reach the point where the knit "some" equal 0!